When it comes to convenience, efficiency, and value, Rhino Rush Energy Shots are the way to go. If an individual seeks out energy supplementation, they are seeking the perfect blend of metabolism igniting power and extremely potent energy boosts. On top of this very simple notion, there are several other factors to consider when choosing an energy supplement. There is the convenience factor of course. 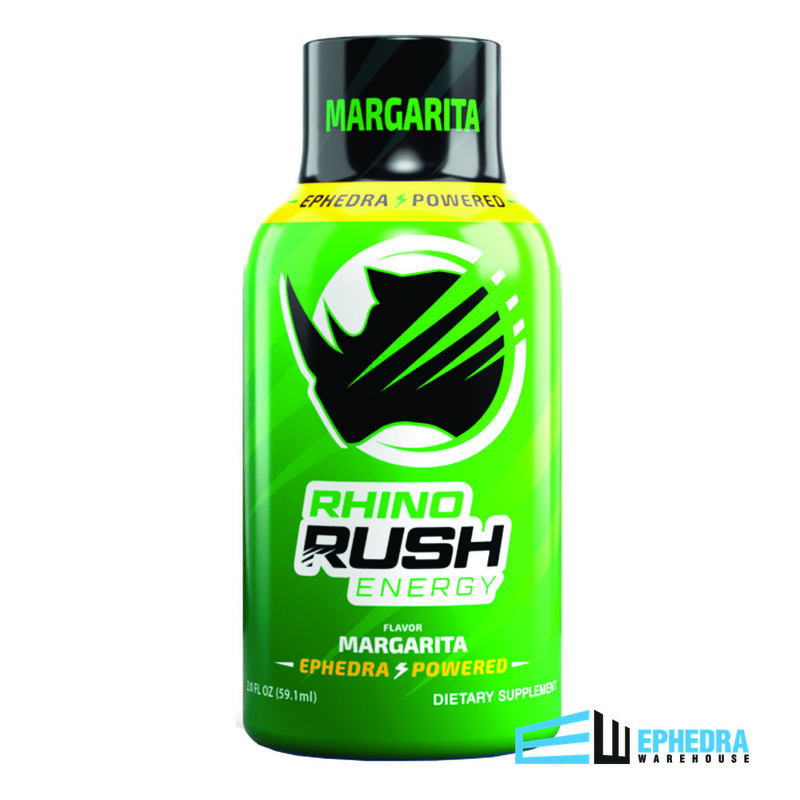 Rhino Rush energy shots made from 50 mg of ephedra are readily available and easy to carry and drink no matter where the individual may be. These ephedra energy shots are fast acting and have a very impressive list of ingredients that put other energy shots to shame. Take caffeine for instance. When used alone, caffeine is good for energy boosts but does not last long, can cause excessive jitters and agitation, and restricts blood flow. When combined with other selective ingredients, caffeine will show its full potential for being just a small part in the igniting power of Rhino Energy. 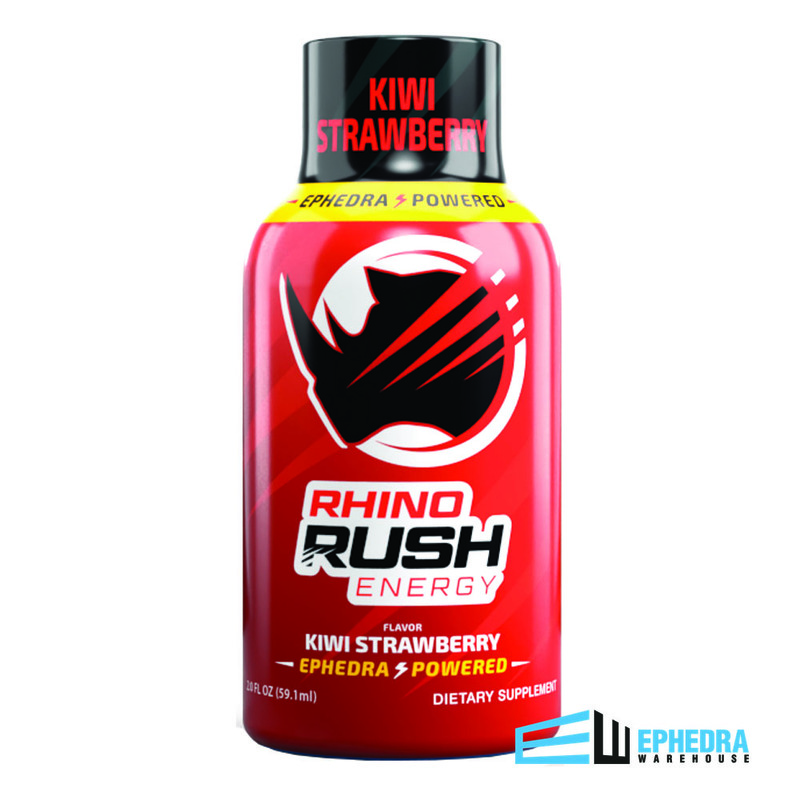 Rhino Rush Energy shots are unique blend of ephedra, taurine, caffeine, and other ingredients to give an individual unstoppable, long lasting energy and support for the body. Taurine is a natural amino acid that is found in the body in small quantities. 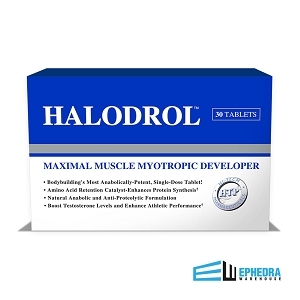 It plays an important role in metabolism and mood stabilization. It acts by directly affecting the oxygen/blood transfer between cells and also removes harmful toxins out of the body. A toxic body is a lagging, slow body! Caffeine of course is a natural stimulant that will increase alertness and heart rate and helping the body burn more calories while at rest. Understanding how these ingredients work, and then combining them all in order to maximize energy, health, and performance, the makers of Rhino Rush Energy shots have done something that their counterparts have only dreamed of. They have created a convenient, healthy, and extremely effective energy shot that consumers are raving over! No more excessive amounts of vascular constricting caffeine! 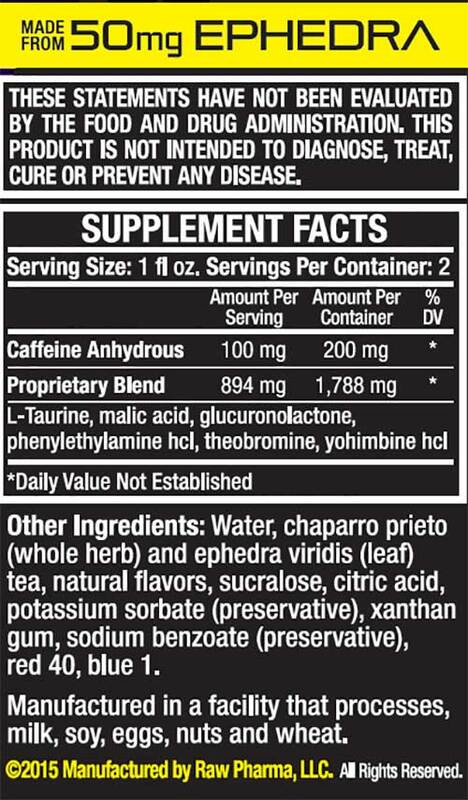 Why not combine a healthy level of caffeine with several other natural energy and alertness boosters to make the ultimate product. 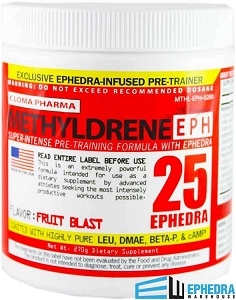 Personally, I've been using ephedra since 2001, and I'm only 29. So I've been using products like this for a long time. This is one of the cleanest, best products on the market, IMO. The only downside is the price. It's about $1.00 too expensive per shot. This is the best energy shot I have ever had. I'm desperate to get it into more stores. You will have no idea what talking about until you try it. As a mother of four boys trust me I KNOW what good energy feels like! I like RhinoRush better than the 5 Hour Energy - tastes better and didn't give me the jitters. I work a rotating schedule, night's and day's Rhino's help with the transition from day's to night's. I never have a crash, it's a nice consistent energy…I love em!!! I have tried just about every quick shot drink or inhaler sold at the gas station or 7-eleven. One day I saw this purple shot Rhino Rush at $2.50 and figured what the heck let me try two. Drank one and by the time I got to my vehicle was mentally wide awake and could not believe the feeling. No shakes, no bad taste, just a smooth focused alert state of mind. Hit the gym, my workout was amazing! Came home ordered 24 and now I am down to three left so I am ordering again! Rhino Rush has a great taste and is much stronger than a 5 hour energy. It hit me much faster than ephedra in the pill. It was almost instant. I a Rhino Rush Shot when I pull up to the gym by the time I'm checked in I am ready to go. Rhino Rush still last 5 Hours, but its a much more intense 5 hours. Rhino Rush is so powerful I only need a couple of capfuls to get up and running. It doesn't give me the jitters or shakes like other products have. The only downside is it ocntains sucralose. I like this product so much that I would gladly put up with it not tasting good in exchange for no sucralose. great product lots of energy service and shipping was amazing, I will def. purchase from your company agene. This is the best energy shot ever. I have tries every one out there and nothing compares or even cones close. If you are sensitive to caffeine only drink half a shot. I've tried every "little" shot bottle on the market like 5 hour energy. They all offer the same type of energy which is mediocre. RHINO RUSH is awesome. 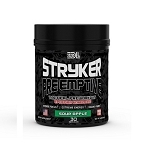 The liquid ephedra works great! No jitters and instant long lasting energy. I would recommend to anyone to try it at least once for them selves. Used it and it works, great stuff. This product proved to be more than expected. It was very good and was what manufacturer said it was. I love the ease of use of Rhino Rush. The flavor a are pretty good, as well. No shakes or jitters that I have experienced with this product. I look forward to seeing results ASAP! Love the energy shots . I drink one every morning to get my internal engine roaring . Hate when I don't have them . I love this product. Will order again! Hands down, one of the best energy products on the market. Energy without nervousness or the jitters. Would recommend. Excellent pick-me-up when the day is dragging and outstanding before workout lift to get you started. Rhino Rush Margarita flavor is the best for getting me through the work day without causing any "jitters" or crash at the end of the day. I love it!! Q: How much ephedra do Rhino Rush shots contain? 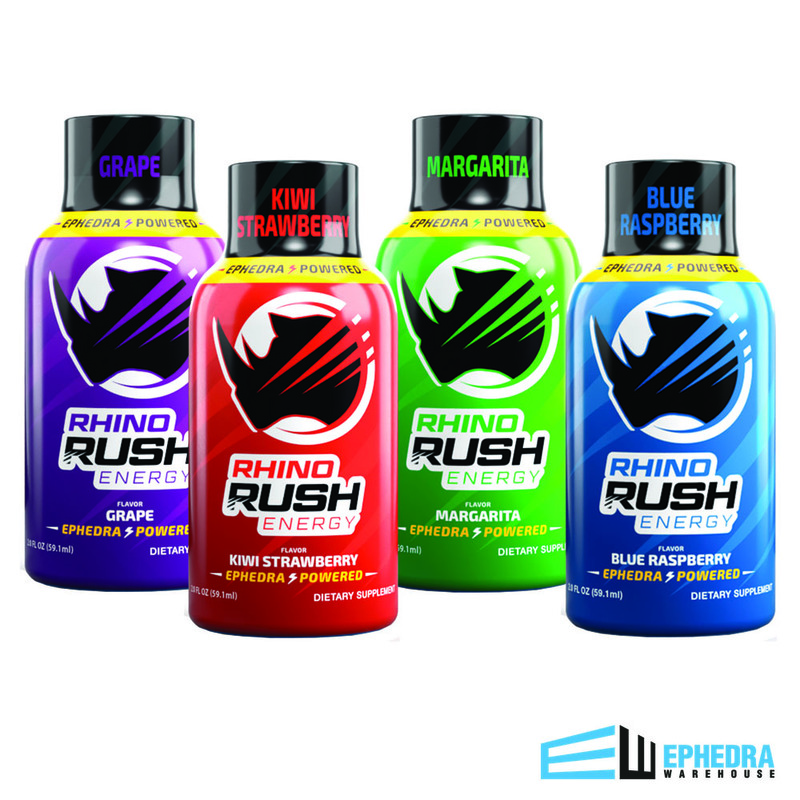 A: Rhino Rush Shots contain 50 mg of Ephedra per Bottle. However, Rhino Rush Ephedra Shots are double shots and contain two servings per shot which would include 25 mg of ephedra per serving. We always suggest starting with a half of shot if it is your first time trying Rhino Rush to assess your tolerance. Was this answer helpful? 14 of 19 Customer(s) found this Answer helpful. Q: Dear, is "RHINORUSH" available in Belgium ? Thank you. supplement, drink 1/2 bottle for increased energy. © 2019, Ephedra Warehouse. All Rights Reserved.